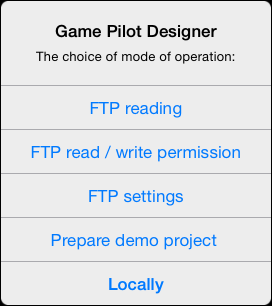 The paid version of Game Pilot allows you to transmit project files using FTP. For this purpose, you need a server where you upload files. The structure of files and folder on the server must be the same as on your iPad (iPhone): each project must have a corresponding folder (project folders must be located in the root directory of the server). In the project folder, there must be a .sc-file that describes scenes (its name should be the same as the name of the project folder), as well as .stt-files of characters, .png and other files. 1. Upload the files to your server using a FTP-client. If you didn't make any settings for your server, select the option FTP Settings. In the opened dialog window, enter your server address, log-in and password. Click Apply. These settings will be saved for future connections. The list of projects will open. Select a project from the list. If you didn't have any files of this project on your iPad (iPhone), the entire project will be loaded on your device. Otherwise, only updated/new files will be loaded. To make possible writing and reading of the updated files from FTP, you should run Game Pilot with the option FTP read / write permission. In this mode, every time you save a file in Game Pilot editor using the Save command in the top menu (or, Cmd+S on a Bluetooth-keyboard), the file is saved in the project folder and the files on FTP are automatically updated. Select FTP read / write permission. Sometimes you will prefer to edit a project in a text editor on your computer, sometimes you will find it practical to edit it directly in Game Pilot. Therefore make sure that the files on your computer are actual as well. If you uploaded a new file from Game Pilot to your server, you have to update this file on your computer manually. Similarly, when you edit any file on your computer, you have to upload it to the server manually as well. After you uploaded a new version of the file to the server, just click Run (Cmd+R) in the opened project editor in Game Pilot. This will update and restart the project.